kandeej.com: BEAUTY NEWS, REVIEWS & GIVEAWAY!!! Yep, you guys asked for my BEAUTY NEWS AND REVIEWS to make a come back- so here's a BRAND NEW BEAUTY NEWS AND REVIEW video hot off my editing software! 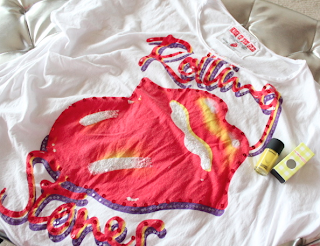 because you guys asked to win some of my shirts or jewelry- so someone is going to win my Rolling Stone shirt and a Al Fredo nail polish from MAC. You also have to like my FACEBOOK PAGE. Follow The Steps: everytime you tweet about it or like the post on fb, or do any of the options below- which you can repeat everyday, to earn more points- to win! Contest starts today and will end next Friday 3-23-12, Eastern Standard Time- because that's how Rafflecopter does it. Winner will have 24 hours to reply, or a new winner will be chosen. If you don't win, be a "good-loser"- as Reba McEntire said, her Mama taught her to be a good loser, so that when she won, she appreciated it so much more! a Rafflecopter giveaway Also, the list of everything I used and showed in the video, is under the video on Youtube, when you click on the description box! I made the anchor necklace myself, you can watch my tutorial on it HERE. I am wearing a ZHOVAK shirt in the video. My earrings are hand-made, I got it at the Melrose Trading Post, it's like a flea market-craft fair in LA. 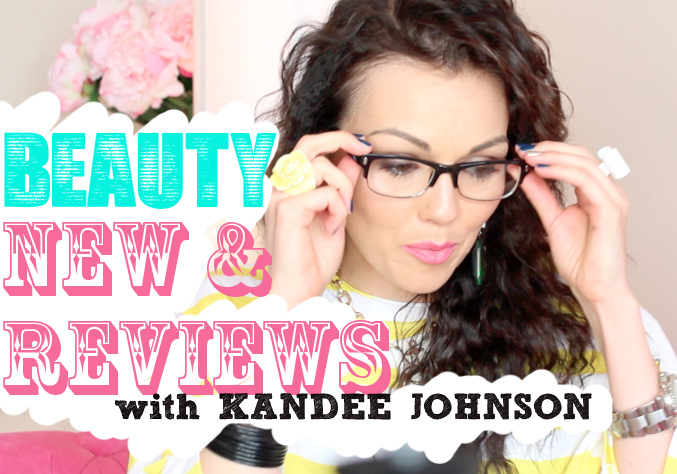 Hope you guys like this..and welcome back BEAUTY NEWS and REVIEWS, baby!!! I was recently in West Hollywood and I wish I would have ran into you. I am from FL and it was my first time in California! I tried to find the melrose trading post but couldn't find it. I did go to Rodeo Dr & downtown La fashion district! Thankyou for inspiration & kindness. Xoxxo! I love your makeup reviews, they've helped me learn to look at the ingredients before I put them on my face! Love you Kandee! Cute hair!!!! Good products def have to check some of those out. Ur so beautiful and btw I love ur hair and make up tutorials it just looks so natural. P.s. Love your videos! I've learned a lot from you! I love ur hair in this video... kinda looks like mine when its natural. love ur shirt too, yellow is my happy color Haha :) Thankyou for all your tips and info kandee. i love u! ur so sweet and ur such an encouragement to me. I LOVE that you're not afraid to show off your personality :)) Kandee, your S M I L E is contagious, Thanks for sharing your videos with us. I've learned from you so many things. i love ur hair kandee!!!!!! I love watching your videos. Not just because of the giveaways, but because of your personality. It always feel like your very such a happy and outgoing person and it rubs off on me. Love u kandee!!! Kandee I have followed you forever. I got the pleasure of listening to you speak at the Beauty Social. You were amazing the entire room stopped to listen to you speak. I tell every girl/ woman I know about you. My hairstylist even thanked me the other day. Please keep doing what you do. Oh don't forget to pick me. Another mom for 4. Kandee you are such an inspiration! Loveeeeeeeeeeeeeeee your videos and late night blogs!!!! Kandee ..you are the most wonderful person in the whole world!! !, and my favorite thing is your youtube channel both of them because everytime you post a new video you make my day. :)... lov u!!!! I love your hair! I used my new BedHead waver yesterday and mine looked just like it! LOVE you and all your videos! i really live the tender tones!!!! The *shirt even lol. TYPO!! I loved hearing your reviews on the Mac products, I'm obsessed with their recent line, I'm always looking to try new lip balms so the two that you recommended I will definetly be getting my hands on them, as well as the lio balm. I love the giveaway. Lastly I just wanted to say that your videos are always so helpful and your personality rocks and outlook on life is just awesome!!! I L<3VE your jewelry in your video, especially your RINGS! Kandee, you're such an amazing person! I have been going to you for so much beauty news and makeup tips. That lipstick color is beautiful!! Love your beauty news videos! I end up wanting to buy so many fun things! Lol. Love you! Love your videos and advice! You look pretty in yellow! Oooh gosh. I really want this giveaway! For a 15 min video, you keep me interested in all the cool makeup goodies! I thought it was pretty hilarious how fast you started to talk near the end. I would love to win this giveaway! I'll try not to get discouraged by my odds! Lol. So excited for this giveaway!!!! So excited for the giveaway! ! Hey Kandee, love everything you do and thanks for being you ! Could you reccomend a good sunblock for the face thats paraben free and great for most skin types? Thanks for the information about parabens! I had no idea they were so bad for us! I love you kandee! Ur such an inspiration! I hope I'll be as bold with my style as you are with yours one day! It's so fun and outgoing! You my dear Kandee are a huge inspiration to me. I am a stay at home mama and hope to pursue being a makeup artist once my little ladies get older. Until then I live through all of your videos and posts. Never stop being you, your amazing! Lots of love. Ahhhh I loove the shirt!! Kandee me love u long time! If I win this will you sign the shirt =D I loooveee you!!! Kandee! I'm a 21 year old who works a full time job with a side ministry and called to start a Christian t shirt company.. I gift like this would be amazing!!! Love your necklace!!! Very cute! I love your videos and my favorite ate you tutorials and your beauty break down videos.